Is HTC ditching Android for Windows Phone? Last week saw HTC announce two new devices for Microsoft’s upcoming Windows Phone 8 mobile operating system – the HTC Windows Phone 8X and the Windows Phone 8S. Both phones are being touted as ‘signature’ devices for WP8, with HTC claiming it is the flagship manufacturer for the OS. So does this mean the highly-regard Taiwanese vendor is moving away from Android and into the loving embrace of Microsoft? HTC has had a very rough time as of late, and somewhat unjustifiably so. Back in 2009/10 the manufacturer was riding high with its Desire line of smartphones, which received high plaudits from critics and enjoyed a great deal of success sales-wise. However, despite its early success with Android, HTC is currently facing financial problems and an ever diminishing share of the Android market. Yet it’s still being regarded as arguably the best Android handset manufacturer out there. What’s happening? Well it depends who you ask. Some say that HTC was caught off guard with how fast the smartphone market grew over the last three years (remember HTC was making smartphones way before the original iPhone appeared on the scene). This meant that much bigger companies such as Samsung could take advantage of their pre-existing supply chains and distribution networks and simply pump out smartphones and dominate the market. But HTC itself largely blames Samsung’s marketing budget. The manufacturer told the BBC that it’s struggling to match the enormous amount of money other manufacturers spend on advertising and that most consumers these days have already made-up their minds before they get to retailers. “We cannot market like a Samsung – or Apple – where you’ve just got brute force tactics, carpet bombing the airwaves with TV commercials,” the manufacturer said. So HTC rapidly need to avoid being another casualty of the smartphone market. They now seem to following the footsteps of Nokia – another company on the rocks – by throwing their weight behind Windows Phone. HTC have produced handsets for Microsoft’s rebooted OS in the past, but this time HTC is claiming flagship status for its devices (much to the annoyance of Nokia no doubt). 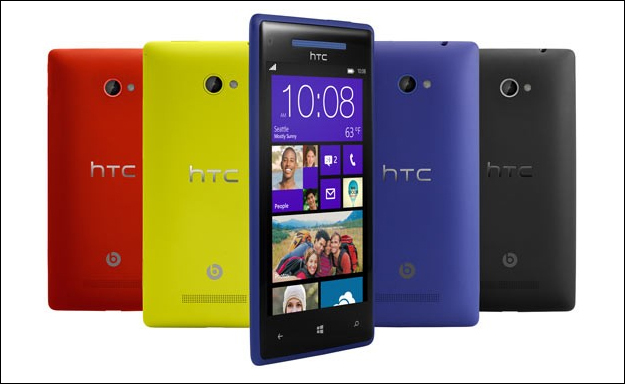 HTC has announced two phones, the first is the HTC Windows Phone 8X, which features a 1.5GHz dual-core Snapdragon S4 processor, 1GB of RAM, 16GB of storage, large 4.3-inch display, 4G LTE, Beats Audio, NFC and more. The phone comes in a range of bright and bold colours, just like Nokia’s Lumia models. The second is the Windows Phone 8S, which is the mid-tier model with 4-inch display, 1GHz dual-core Snapdragon S4 processor, 512MB of RAM, 4GB of storage, 5-megapixel camera, Beats Audio and an expandable memory slot. Many have written off Microsoft’s mobile platform given that it currently holds just 3.5% of the global smartphone market, with Android at around 49% and iOS 17%, according to IDC’s latest figures. But what those figures don’t tell you is that – apart from Samsung – few manufacturers are making much money out of Android. 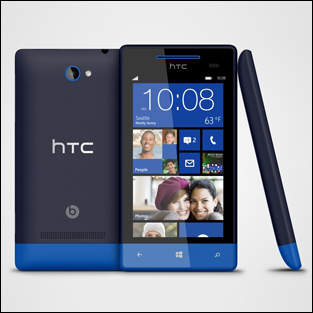 Perhaps HTC sees the writing on the wall and is now making a bet that Microsoft’s marketing muscle, and its hordes of cash, will ensure Windows Phone 8 grows rapidly after its launch next month. If HTC can ride that wave of growth then it may have a brighter future ahead.